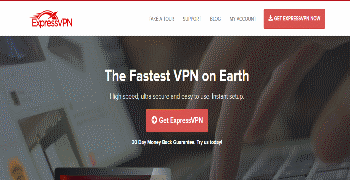 While ExpressVPN is a well established VPN service that has been in the market for almost 5 years, it doesn’t stop working to maintain its place as a top provider. This US-based company is very popular in the VPN industry, as it offers a good selection of servers and features that users will need to fully enjoy a flexible and secure online browsing experience. Choosing VPN express as your provider means that you will be able to get access to a wide range of services. They offer compatibility with multiple devices and operating systems, as well as a useful set of functions that are included in their plans, without additional cost. There are many providers that stand out for one or two particular reasons but ExpressVPN seems to have found the right balance in every aspect of its service. From servers to customer support, ExpressVPN has worked to ensure that their VPN solution works well, offering a great experience for their customers. ExpressVPN can be used with multiple operating systems and it offers dedicated VPN clients for Windows and Mac, as well as apps for iOS and Android, which is a feature that stands out and highlights the convenience of ExpressVPN. This makes the setting up process easier and faster, as all you need to do is to is to install the software and run it. Linux users will need to configure the VPN service manually, which is a more complex process but it is preferred by more experienced users. ExpressVPN’s website also offers detailed tutorials to configure the VPN manually. The VPN is easy to use and offers functions such as connecting to the best location automatically (Auto-Connect), browsing history through ExpressVPN and protocols switching. You can use the service with PCs, mobile devices such as smartphones and tables, as well as DD-WRT routers. In terms of protocols available, you will find a comprehensive selection of options that include PPTP, SSTP, L2TP/IPsec and OpenVPN. EXpressVPN has also stepped up its game when it comes to strong security and it offers advanced 256-bit encryption. Speed is an aspect that ExpressVPN highlights about its service and it should be said that they perform really well in this regards, specially when compared to other providers. It is important to keep in mind that while using a VPN, you should expect a slowdown in your connection, particularly when you are using a highly secure protocol such as OpenVPN. However, ExpressVPN is generally fast and you will only experience a minimal decrease in the speed of your connection. You will be able to enjoy media content without a problem and since ExpressVPN counts with a large number of servers, you will have the chance to find one near you, which will improve the speed. Since ExpressVPN offer unlimited bandwidth and they do not have speed restrictions, you can stream your favourite TV shows and watch videos online whenever you want. In some occasions, VPN users may experience issues to connect to servers, as too many users are connecting to them. However, this is something that will not affect you as much if your provider counts with a large network of servers, which is the case of ExpressVPN. As the company continues expanding its network, it is likely that the performance and speed will improve further. ExpressVPN used to be one of the most expensive VPN providers and even though the prices are still quite high when compared to other options, they made their plans more affordable. If you subscribe for one month, you pay $12.95, while a subscription for six months would reduce the monthly price to $9.99, as the total payment would be $59.95. If you are confident that ExpressVPN is the right option for you, you can opt for a 12 months subscription, which reduces the price per month even further. The price per month would be the equivalent to $8.32, as the total cost of the plan is $99.95. 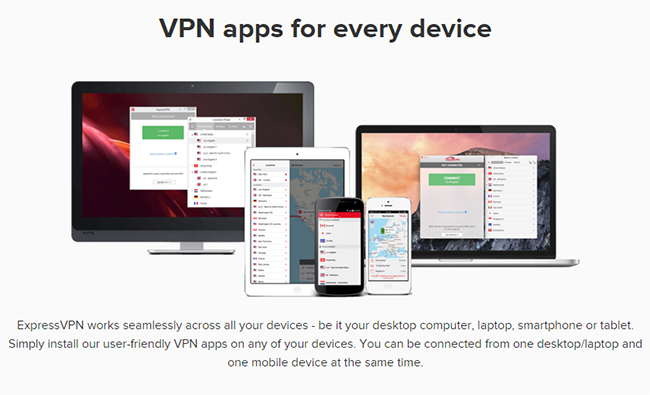 All VPN plans include ExpressVPN Apps for the OS and mobile devices supported and offer SSL-Secure site. They also provide high speed and unlimited bandwidth, as well as access to all the servers in ExpressVPN’s network. While there is not free trial available, they have a money back guarantee that covers you for the first 30 days of the service, meaning that you can get a refund if you are not entirely satisfied with their service. This 30-day money back guarantee is one of the aspects that sets them apart since most companies offer 7 days or even less. ExpressVPN does not keep logs of your online activity (only connection logs) and they promise not to monitor their customers’ sessions, unless there is suspicion of illegal use. However,The fact that the company is based in the US and is subject to Data Retention Laws, would concern users that want to ensure that their identity remains protected and that their data remains private. Being located in the United States could also mean that the company more likely to be infiltrated by the NSA. ExpressVPN gives you the possibility of switching between servers without restrictions. You can access their large selection of servers located in 78 countries and continuously expanding; including United States, Australia, Egypt, Costa Rica, Switzerland, South Korea, Hong Kong, Japan, India, Romania, Ukraine, Brazil, Argentina, Denmark, Sweden, Finland, Czech Republic, Ireland and more. Having a network of servers that covers every continent means that you have more flexibility to change your IP address in order to access the content you want from anywhere in the world. The website offers Support and Setup sections that address the most common issues that you may come across. If you need additional help, you can contact ExpressVPN’s customer support team using their ticket support system or sending them an email. Live chat is also available every day. Alternatively, you can call their phone number and leave a message with your details but note that they will only reply by email. In general, their service is very efficient and their staff is very helpful. ExpressVPN is a solid VPN provider that offers satisfactory speeds, a wide selection of servers and good customer support. However, the fact the that they keep some logs and that are subject to data retention laws, may put off many users. Another downside is that their prices are higher than other options that offer the same or even better features. Still, their VPN is easy to use and works well most of the time, so it is worth giving it a try.